Find all news regarding products, fairs & reviews, jobs and downloads in this section. company and the existing jobs. company and will start the first negotiations in the next few weeks. Restructuring expert Christian Zschocke has been appointed by the Constance district court as the preliminary insolvency administrator. The objective of the preliminary insolvency administrator is the restructuring of the company, whose business operations he will initially carry on unrestricted. SPAUN electronic suffered recently from drops in sales, which resulted in the company falling out of the profitability zone. The company wanted to make up for the drops in sales in the traditional business areas through new, innovative products in the field of optical distribution technology. This business area was building up but could not compensate for the drops in sales. As things developed, the principal banker gave notice of the credit lines terminating in November 2018. "It pains us greatly to have to take the step of committing this long-standing company with almost 50 years of history to insolvency proceedings." However, thanks to the very early application for insolvency, as a result of an impended inability to meet payments, the company has taken all precautions for successful restructuring. Zschocke was on-site immediately after his appointment in order to conduct the first talks and to gain an impression of the economic situation. "The framework conditions for long-term continuation of the business are in place." He will spare no effort to ensure that as many workplaces as possible are retained. The employees were immediately informed of the current situation in a staff meeting. To ensure that the approx. 40 employees at the site in Singen am Hohentwiel do not suffer a loss of earnings, the preliminary insolvency administrator has immediately arranged the short-term financing of support funds and has obtained the agreement of the responsible employment agency. This secures the payment of wages and salaries, initially until the end of November. Until then, Zschocke intends to find out and identify if there are opportunities for Spaun electronic to survive. 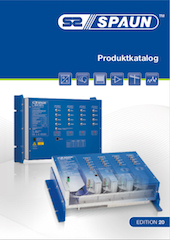 From now on our new Product Catalogue Edition 20 is ready for download. You can expect new products such as our optical transmitters and receivers AURORA SOTx and AURORA SORx as well as SOLAS SOTx and SOLAS SORx. SCR single cable systems SMA 8 F from SPAUN. Please check the attached report (German only). Audio Modulator in PAL VAM 420 NG PAL from SPAUN.